Port Sentinel is small city with a significant star paladin temple next to it. 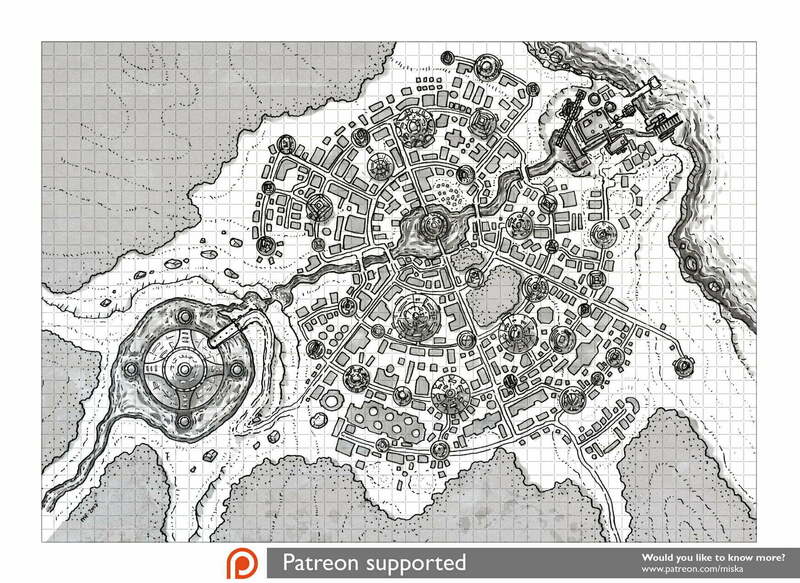 The map is made according to one of my $5 tier patron’s wishes ( I hope I got most of the things right 😀 ) and features a city with multiple towers, “a star paladin” temple and a construction yard. There are some roads but most of the traffic consists of speeders and other flying vehicles. One grid square equals about 100 feet or 30 meters. South-West of the city stands a majestic star paladin temple high above the city. It is built on an elevated ledge and surrounded by a lake. Next to the sea shore, on the North-Western border of the city there’s a construction yard with huge cranes, watermills and steaming pipes.